Computational simulations have proven invaluable in understanding the formation and evolution of galaxies. When the first galaxies were made in simulations, they formed… too well. Gas cooled too much and too fast, and these galaxies formed way too many stars. These first simulations, however, missed a whole host of physics that today fall under the umbrella of “feedback” processes. Feedback encompasses a wide range of really interesting astrophysics, including radiation from stars heating and ionizing surrounding gas, thermal and kinetic energy injection from supernova explosions, heating from active galactic nuclei (AGN), and the impact of AGN jets. Among other things, these processes can drive galactic winds, blowing gas out of galaxies, and slowing down star formation. Including every type of feedback in a simulation is a great way to produce realistic galaxies, but is unfortunately computationally expensive and impossible to do perfectly. In fact, much of the relevant physics occurs on scales far smaller than the simulation resolution, and must be addressed with what is called “sub-grid” models. Today, the game of producing realistic galaxies in simulations boils down to figuring out the right physics to include, while minimizing computational costs. Much progress has been made in this field, with one giant exception: radiation. Properly accounting for radiation is expensive and complex; the nearly universal solution is to make assumptions about how photons propagate through gas, so it doesn’t have to be computed directly. The authors of this paper present the first galaxy-scale simulations of “radiation hydrodynamics”, or hydrodynamic simulations that directly compute the radiative transfer of photons, and their feedback onto the galaxy. The authors produce galaxy simulations using RAMSES-RT, an adaptive mesh refinement (AMR) code that includes a nearly first-principles treatment of radiation, based upon the RAMSES code. Their treatment of radiation breaks photons into five energy bins, infrared, optical, and 3 ultraviolet bins separated by hydrogen and helium ionization energies. These act on the gas through three primary physical processes; the ionization and heating of the gas through interactions with hydrogen and helium, momentum transfer between the photons and the gas (radiation pressure), and pressure trough interactions with dust (including the effects of light scattering off of dust). In addition, they include prescriptions for star formation and supernova feedback, radiative heating and cooling, and chemistry to accurately track the abundances of hydrogen and helium and their ionization states. The photons are produced every timestep in the simulation from “star particles” (representation of groups of stars in the simulated galaxy); the number of photons and their energies are determined by the given star particle’s mass and size. The authors include all of this physics into simulations of 3 disk galaxies (labelled G8, G9, G10), each containing roughly 108, 109, and 1010 solar masses of gas + stars, embedded in dark matter haloes of about 1010, 1011, and 1012 solar masses. The heaviest of these three is comparable to the Milky Way. Fig. 1 above shows face-on and edge on views of radiation flux from the G9 galaxy in all 5 photon energy bins. In each of their simulations, they evolve each galaxy for 500 Myr, examining how turning on / off various feedback processes (namely supernova, radiation heating, and radiation pressure) affect the evolution of each galaxy. Fig. 2 gives the combination of physics in each simulation type and their labels. Although they produce a thorough investigation into many of the details of their radiation feedback, this astrobite will focus on only two effects: how the radiation affects the formation of stars, and its effect on driving galactic winds. Fig. 3 presents the total star formation (in stellar masses) and star formation rate for the G9 galaxy under 6 different simulations. The labels in Fig. 3 are given in Fig. 2. The dashed lines give the mass outflow rate from the galactic winds as measured outside the galaxy. On one extreme, the simulation with no feedback converts gas into stars too efficiently, and drives no galactic winds. On the other, the full feedback simulation (dark red) produces the least amount of stars, but interestingly, has weaker galactic winds than some of the other simulations. The three thick lines in the top of Fig. 3 give the supernova + radiation feedback simulations. Compared to the supernova only simulation (blue), the radiative heating feedback provides the dominant change, while including radiation pressure and dust pressure only make small changes to the total star formation. Fig. 4 shows the outflows of the G9 galaxy at the end of the simulation run, with SN feedback only on the left, and full feedback on the right. 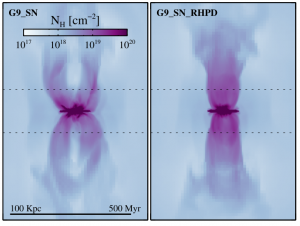 Although the two are morphologically quite different, the authors show that the differences in total mass loss from galactic winds between the two simulations is minimal (see Fig. 3). 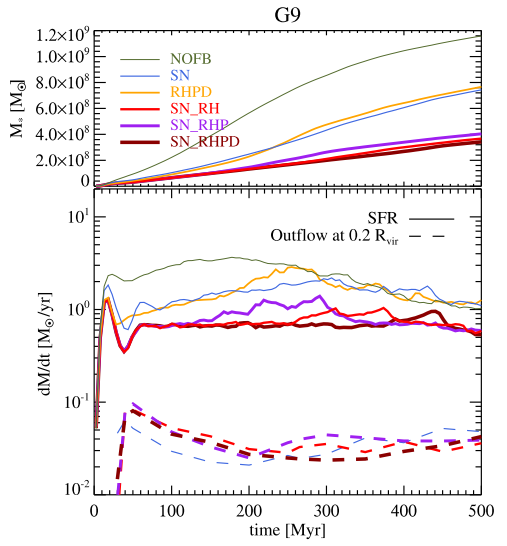 In fact, they show that the full radiation feedback model produces slightly less winds, a byproduct of slowing down star formation in the galaxy. The authors have shown that radiative feedback does play an important role in studying galaxy formation and evolution. In this work, they sought to characterize the effects of supernova and radiative feedback vs. supernova feedback alone. In future work, the study of radiation feedback on various scales, from small slices of the galactic disk to larger galaxies, and the inclusion of AGN feedback in these simulations, will be important in piecing together a complete understanding of galaxy formation. Even though the role of radiative feedback in galaxy formation and evolution is very interesting, what surprised me the most in this article is the role that computer simulations are playing in modern research. Computer models, although imperfect, seem to be allowing not only the testing of new theories but also the finding of new explanations altogether.